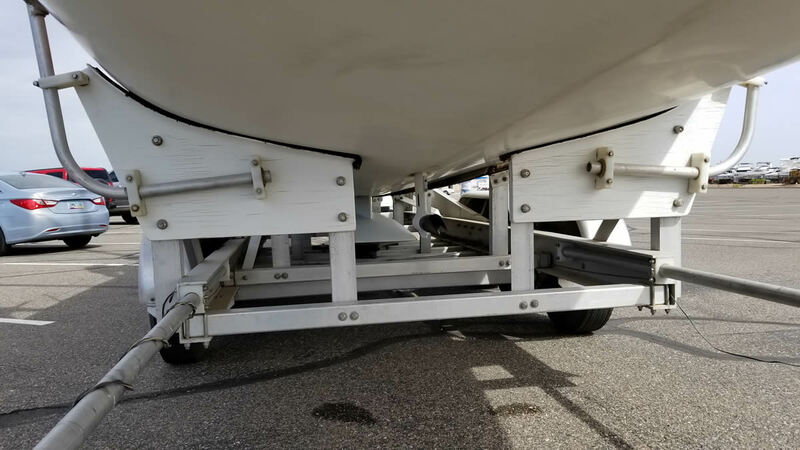 40FT trailerable sailboat with 8.5FT beam can be trailered anywhere without permits. Towing weight is about 12,500LB; towed regularly at 65mph on cruise-control, with standard 4wd 3/4-ton diesel pickup (not a dually). Under 11FT high on trailer - no issues with bridges or toll-booths. 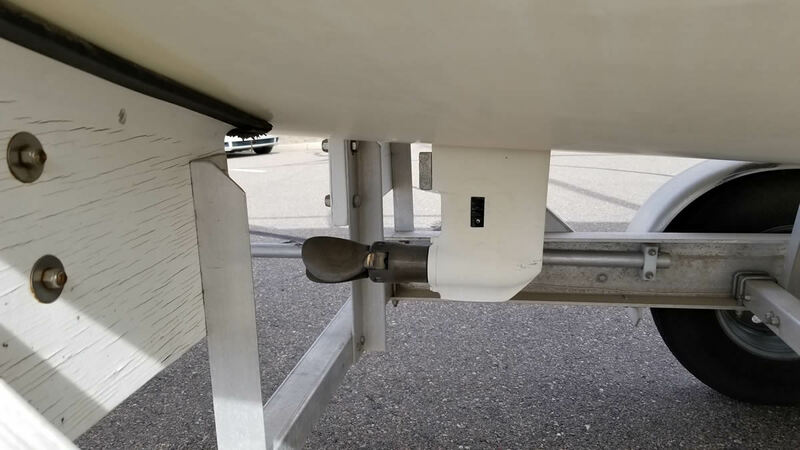 Patented mast-raising system can be rigged in under 30-min, and launched at standard boat ramps, enabled by drop-keel on electric screw-jack and removable rudder. This is the prototype vessel for Rio Hondo Yachts, LLC. Built in 2007, towed to Great Lakes in 2008 for Port Huron to Mackinac and for Chicago to Mackinac races. Tied-up on Mackinac Island on Wednesday morning and back in Phoenix on Friday night with two drivers. Also raced Newport to Ensenada and MDR to San Diego. Launched in 24-min in Newport back-bay several times, just dip the mast for the PCH bridge. 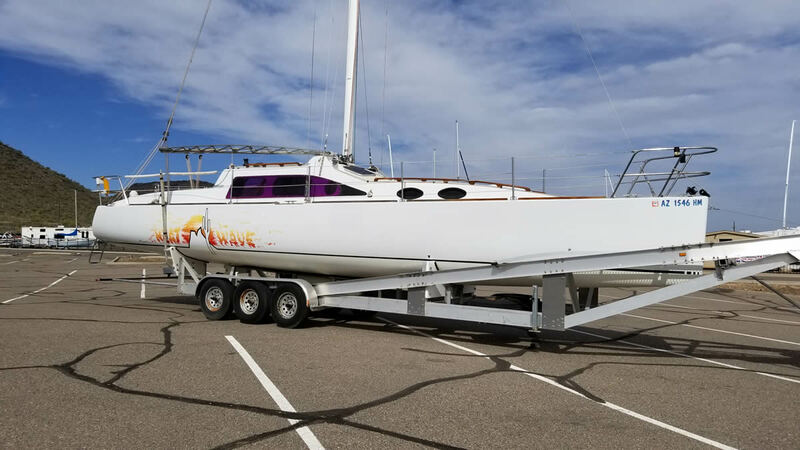 Perfect for the Baja-Ha-Ha; to avoid the Baja-bash tow the vessel back from Cabo in matter of hours. 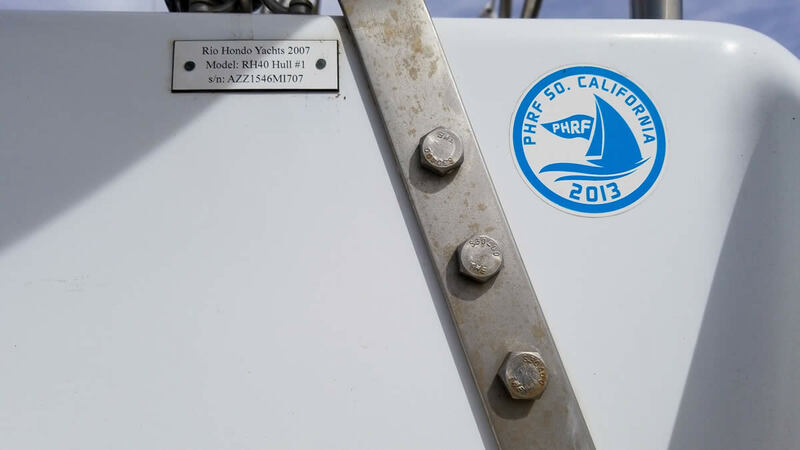 Valid current SoCal PHRF, also measured and rated for IRC and Americap but these certificates must be renewed. 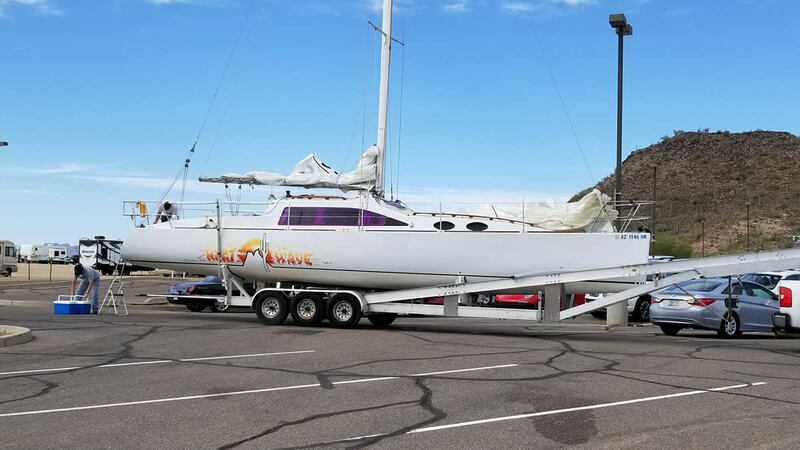 Towed to San Diego and Los Angeles repeatedly, day-sailed on local lakes on a regular basis. I stored this boat out of the water for free on an RV pad with NO SLIP FEES; about $400 per year to insure. Includes aluminum (no corrosion) 3-axle goose-neck trailer with electric/hydraulic disc brakes. Could store with mast-up at Lake Pleasant or Dana Point and launch in 10-minutes. Displacement is 9500LB, D/L ratio 76 so this is a ULDB, very much like a small Santa Cruz 70. 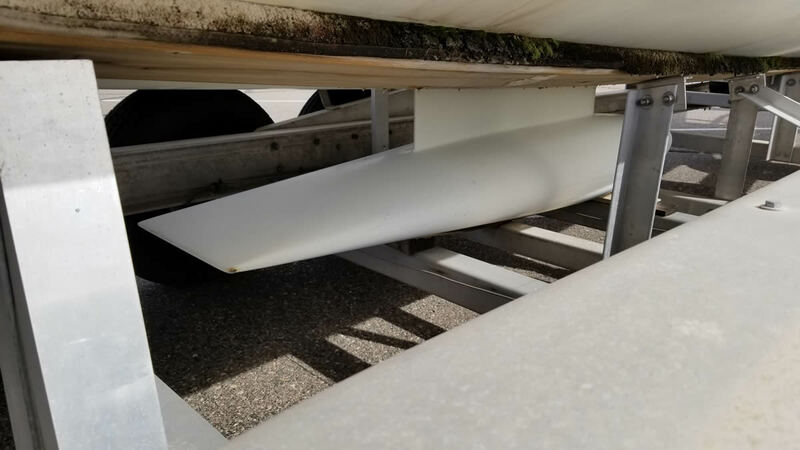 Ballast is 3600LB bulb with keel-down draft of 7FT. Excellent ultimate stability with positive righting arm to 147-degrees of heel. Go to weather at 7.2 knots and 42-45-degrees true wind-angle, or reaching and running at 10-12 knots in moderate breeze. Have repeatedly seen 13-14 knots in plus 20 knots of breeze at 160-degrees true. Working sail area is 600 SQFT with self-tacking Jib. Also included is a roller-furling 150% mast-head genoa of 630 SQFT used like the code-zeroes in the Volvo Ocean fleet. Asymmetrical spinnaker of 980 SQFT. The inspiration for this design was the J-105, but this boat is faster and has standing headroom. We finished middle of our section with cruising sails and amateur crew in the 100th Chicago-Mackinac race against J-122's, Benneteau 46.7's, etc. Stan Honey was navigator on one of the other boats in our section. (Look for "Heat Wave" in the 2008 race results). Sails are in good shape. 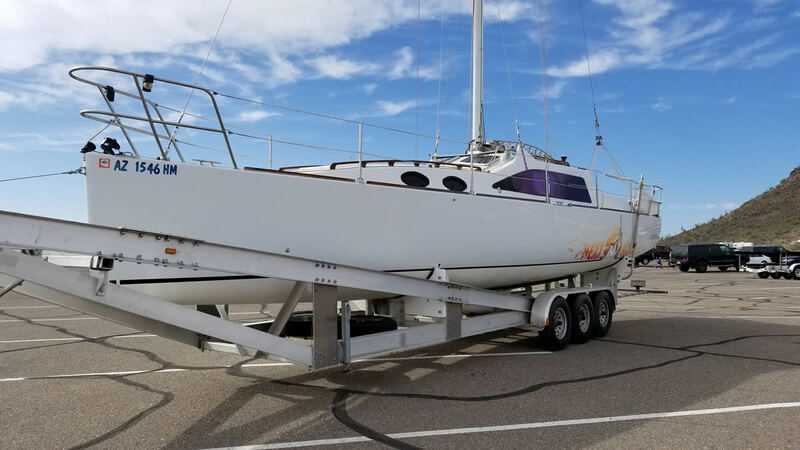 Could be a very competitive boat with practiced crew and sail-development program. Machinery is 12.5HP Honda sail-drive with folding prop, will power the vessel at 6.5 knots for almost 24 hrs on 11 gallons of gasoline. Easy return from Ensenada, or better yet, tow her back. Standing headroom in main cabin and galley, enclosed head, sleeps 6 below. 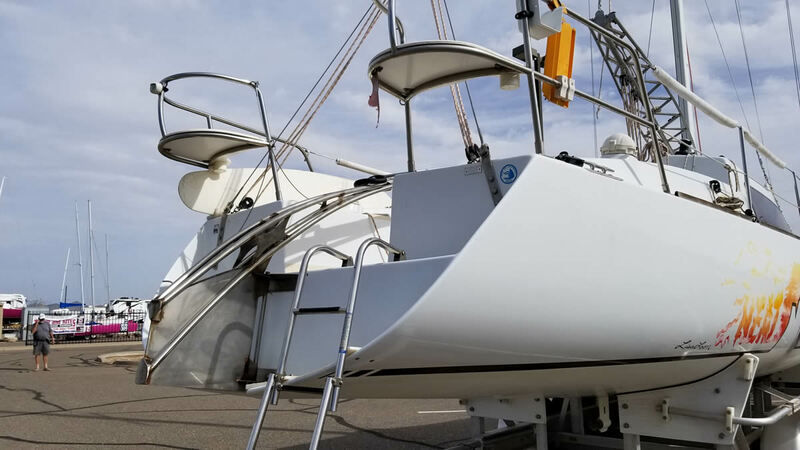 High quality battery charger, and inverter, 220 amp-hour house battery good for about a week of cruising, can be charged with engine or shore-power. Over $100,000 invested not including labor.